Now you can afford to serve your clients their favorite drinks in custom printed mugs that boast your logo, images or text. Our drinkware is ideal for businesses like gift shops, coffee shops, hotels, restaurants, bars, and diners. Choose from a large variety of vibrant styles and designs. The products are available in an array of vivid colors, including red, brown, purple, black, green, blue, orange and yellow. Promotional Bounty Ceramic 11oz Mug comes with C-shaped large, comfortable handle. Custom Ceramic Hampton Mug 11oz is made from ceramic. Personalized Ceramic Atlas Mug 15oz is made from ceramic. Promotional Constellation Mug 12oz comes with ear-shaped large comfortable handle. Custom Ceramic Café Mug 12oz is made from ceramic. Promotional Vitrified Logo Toledo Mug 8.5oz is made from ceramic. Custom Imprinted Ceramic Bistro Mug 14oz is made from ceramic. 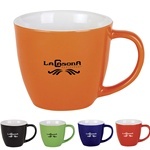 Logo Imprinted Two-Tone Maya Mug 11oz is made from high-quality ceramic. Custom Ceramic Duo-Tone Mug 11oz is made from ceramic. Custom Imprinted Zander Mug 14oz comes with wide mouth and narrow base. Custom Imprinted Zapata Mug 15 oz comes with large ear-shaped comfortable handle. Promotional Two-Tone Ceramic Café Tumbler 14oz comes with neoprene wrap. Personalized Two-Tone Ceramic Dolce Mug 10oz comes with a spoon. Custom Chalk-It-Up Two-Tone Mug 11oz comes with the choice of chalking ceramic mug up. Personalized Two-Tone Ceramic Aura Mug 14oz comes with color-accent C-shaped handle. Custom imprinted Marble Ceramic Mug 12oz is made from ironstone ceramic. Custom White Classic Ironstone Ceramic Mug 12oz is made from ironstone ceramic. Custom Ceramic Taza Mug 16oz is made from ceramic. Personalized Ceramic Noir Mug 12oz is made from ceramic. Personalized Ceramic Camper Mug 14oz is made from ceramic. Custom Grande Ceramic Café Mug 16oz is made from ceramic. Promotional Two-Tone Coffee Mug 12oz is made from ironstone ceramic. Personalized Vitrified Tulsa Funnel Mug 12oz is made from ceramic. Custom Vitrified Imprinted Military Mug 10oz is made from ceramic. Personalized Dou Tone Ceramic Noble Mug 17oz is made from ceramic. Custom Ceramic Sherwood Mug 16oz is made from ceramic. Custom Ceramic Festival Mug 13oz is made from Bone China. Personalized Bistro Ceramic Duo-Tone Mug 16oz is made from ceramic. Personalized Full Color Wrapped Ceramic Mug comes with comfortable C-handle. Customizable Latte Coffee Mug 17oz is made from ironstone ceramic. Custom Ceramic Taza Speckled Mug 13oz is made from ceramic. Promotional Ceramic Noble Mug 17oz is made from ceramic. Promotional Bistro Two-Tone Coffee Mug 12oz is made from ironstone ceramic. Custom Ceramic Sterling Mug 14oz is made from ceramic. Personalized Ceramic Quadro Mug 17oz is made from ceramic. Custom Magnum Large Coffee Mug 15oz is made from ironstone ceramic. Logo Imprinted Fiesta Coffee Mug 11oz is made from ironstone ceramic. Promotional Two-Tone Mug 11 oz. comes with comfortable C-handle. Promotional Shiny Bistro Ceramic Mug 15oz is made from ironstone ceramic. Logo Imprinted Matte Java Coffee Mug 12oz is made from ironstone ceramic. Promotional Ceramic Adobe Mug 16oz is made from ceramic. Custom Full Color White Mighty Mug 15oz features Xtra-large C-shaped comfortable handle. Custom Smile Grande Ceramic Café Mug 17oz is made from ceramic. Promotional Double-Wall Fun Tumbler 15oz is made from plastic. Personalized White Classic Wrap Mug 11 oz comes with C-shaped comfortable handle. Custom Vitrified Endeavor Mug 14oz is made from ceramic. Personalized White Short Latte Ceramic Mug 12oz comes with C-shaped comfortable handle. Personalized White Curve Mug 15oz comes with a large and comfortable handle. Promotional Textured Shiny Interior Ceramic Mug 12oz features unique shape. Personalize Two-Tone Shiny Ceramic Mug 14oz is made from ironstone ceramic. Custom Imprinted White Metro Mug 14oz is designed with C-shaped comfortable handle. Custom Two-Tone Mighty Mug 15oz is designed with bright inside colors. Custom White Maxx Ceramic Mug 18oz features ear-shaped comfortable, large handle. Promotional White Super-Size Mug 20oz comes with Xtra-large C-shaped comfortable handle. Promotional White Mighty Wrap Mug 15oz comes with C-shaped comfortable, large handle. Custom CuppaJo Diner Coffee Mug 12oz is made from ironstone ceramic. Custom White Tall Latte Mug 16oz comes with ear-shaped comfortable, large handle. Personalized Two-Tone Latte Ceramic Mug 12oz comes with comfortable handle. Promotional Black Short Latte Mug 12oz is designed with C-shaped comfortable handle. 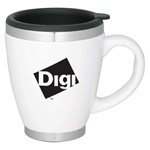 Logo Imprinted Bistro Color Mug 20oz is made from ironstone ceramic. Promotional Black Mighty Ceramic Mug 15oz comes with Xtra-large C-shaped comfortable handle. Custom Matte Barrel Imprinted Ceramic Mug 16oz is made from ironstone ceramic. Custom Black Maxx Ceramic Mug 18oz comes with sleek, tall shape. Promotional Black Super-Size Mug 20oz comes with Xtra-large C-shaped comfortable handle. Promotional Vixon Coffee Mug 9oz is made from ceramic. Promotional Black Metro Ceramic Mug 14oz features C-shaped comfortable handle. Personalized Ceramic Kisser Coffee Mug 16oz is made from ceramic. Custom Mugster Ceramic Mug 15oz is made from ceramic. Promotional King Diner Coffee Mug 14oz is made from ceramic. Personalized King Diner Mug 15oz is made from ceramic. Logo Imprinted Travel Ceramic Mug 16oz is made from ironstone ceramic and plastic. Logo Imprinted Ceramic Collier Coffee Mug 14oz comes with double-wall durable construction. Custom Ceramic Deluxe Coffee Mug w-Lid 12oz is made from ceramic. Customizable Primo Porcelain Coffee Mug 14oz is made from porcelain and stainless-steel. Using promotional products to raise awareness and expand your reach is any company’s goal. Customizable ceramic mugs from LogoToYou.com are ideal as giveaways and for tradeshows to pass out to both current and potential customers. You can advertise your business by displaying your logo and making a long-lasting impression. Cruise lines, theme parks, vacation resorts and other leisure venues like having customized drinkware to sell or give to their guests. Popular styles include full photo cups, two-tone and super-size varieties. These are great keepsake items for guests to remember their vacation or take home for friends and family. All our items can be imprinted with unique artwork or messages, which makes them popular items with talk shows and morning news teams who want to express their personality. Place your order for these budget-friendly ceramic mugs today and change the look of your café. With stylish designs, you’re sure to get the attention of your patrons and help get their day started when they walk off with a customized cup of coffee. Choose to have your logo or artwork printed on the items or talk to our talented art team who will help you come up with a design, text, and color. Once decided, we will show you proofs for free, so you know what the outcome will look like. Get started with your custom printed mugs at Logo To You today. Our customer care representatives are ready to answer your questions and talk you through the ordering process. For your convenience, we accept several forms of payment and can process and ship your order within a couple of working days. Our selection includes jumbo mugs, lattes, barrel mugs, Dakota, bistro, Café Grande, and much more. We have a range of styles and sizes, and you can easily mat the colors to your company or campaign. We are committed to providing high quality to products, so your promotional efforts will last a long time (even when they are put through the dishwasher repeatedly). Contact us today to set up your order or take a look at some of our free samples to get a closer look at some imprinted products. I wanted to thank you for the work that you all did on our mugs that we ordered for our annual conference! Everyone loved, loved, loved them and we are going to be doing the same mug next year. I think that this was the biggest hit on a mug that we’ve done in ages, so thank you so much for working with us to get it right! Thank you much for the nice email, just wanted to let you know that my experience ordering mugs with your company was awesome and the mugs are selling very quickly, they are wonderful and keep drinks really hot. Thanks again for the quick, pleasant service I received. thank you so much for the customer service you provided. The coffee mugs were astonishing, thank you. Who would provide their own personal cell phone number to their customers. I would definitely recommend you to many. The water bottles and coffee mugs came today and they are wonderful!!! Thank you so very much. I will be in touch in the next couple of days to order some additional items for our Homecoming Weekend. Chris - just a note to let you know how pleased we were with our coffee mugs. What a great company to work with, will highly recommend you to others. Our staff and faculty were very pleased with their department gifts at our appreciation dinner.